The Content Planner is a tool we’ve built to make the HMRC website transition to GOV.UK easier and more efficient. It gives HMRC and the HMRC transition team in GDS a shared space to create, agree and comment on content plans for each of the topics we’ll be transitioning to GOV.UK in the coming months. In the early stages of the project we were using spreadsheets - and lots of them. For a site as big and complicated as HMRC, capturing content plans in spreadsheets was time-consuming and unnecessarily challenging. It also increased the risk of human error because each time a content plan changed we would have to create another version of the spreadsheet and email it to all the people that should be aware of the change. We were drowning in spreadsheets, and multiple versions of them. We tried to use Google Sheets in Google Docs (a cloud-based service we use extensively at GDS) to collaborate on the content plans but there were problems with this approach including limitations in Google Sheets, for example because they can’t track changes to plans. We decided we had to do something about it. Building on the work Clare Moss had begun in summer 2013, we analysed the needs of GDS content designers and HMRC staff working on content plans. 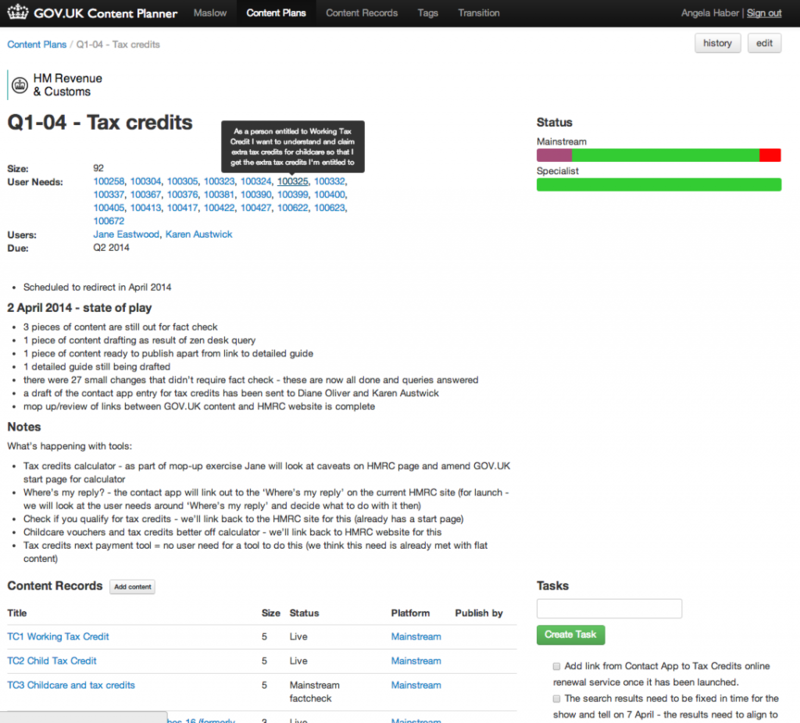 Matt Ford began building an alpha of the Content planner while working on the Contacts app and we started using it within the HMRC transition team as a beta product in February. Content plans need to be built on validated user needs. Before you can create a content plan in the Content Planner, you need to have drafted the user needs for your topic and created entries for each user need in Maslow. The Content Planner talks to Maslow and you will be able to select the user needs stored in Maslow when you’re working on content plans. The content planner should not be confused with the Transition Tool redirection software which gives departments and agencies the ability to manage their own redirects (to GOV.UK or the national archive) after content creation rather than relying on GDS to make changes. 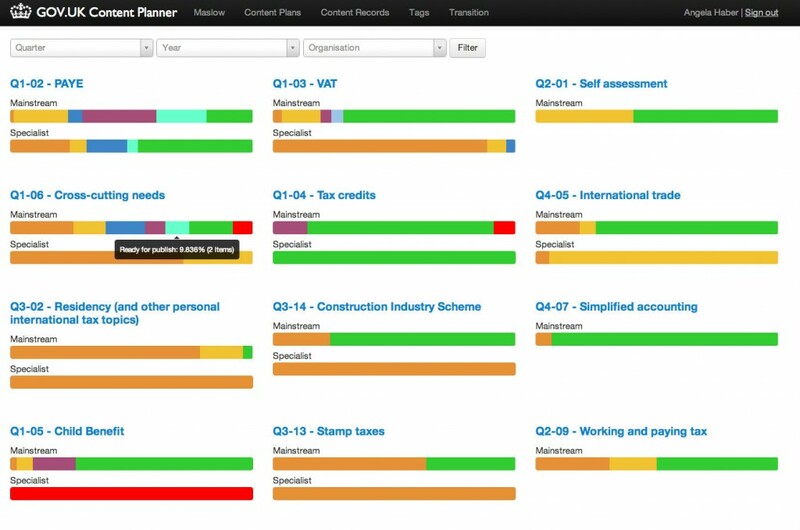 Angela Haber has created a guide to using the content planner which is available from GDS or from your HMRC category manager. Is this tool available outside HMRC, or is it for HMRC only? I ask because it would be a boon to other information-dense agencies and departments. You will need to contact your GOV.UK transition manager to ask about this. I've now left GOV.UK so I'm not up to date on the current plans but when I wrote the blog post I was not aware of any intention to let any other department use it, which is a shame. By way of background, this tool was always built with the idea that any department could use it, not least because it was built on the original planning that Clare Moss did in summer 2013 for a suite of tools to be offered for all of transition. When the transition tools team was reorganised this work was put on ice. We picked this up within the HMRC transition team as we saw it as an important part of building a collaborative content production process across GDS and HMRC. It appears to have worked very well so far.